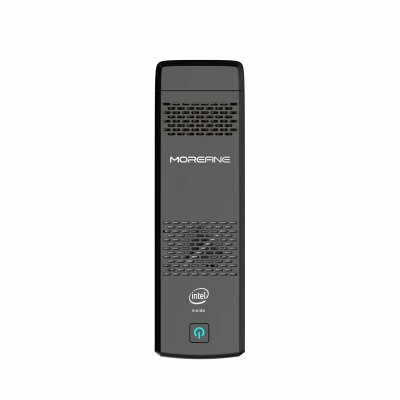 Successfully Added M1 PC Morefine Box- Windows 10, Intel Z8350 CPU, 4GB DDR3 RAM, Dual-Band WiFi, 64GB Internal Memory, HDMI, to your Shopping Cart. M1PC takes personal computing to the next level. With its sleek and compact design, this Windows mini PC can be easily installed while nearly taking up any space. It features a little bracket, thanks to which it can be efficiently attached to the back of your display – allowing you to install it completely out of sight. Featuring both an HDMI slot, this Windows 10 mini PC can be used with both your PC and TV display. With its powerful hardware in place, this mini PC lets you enjoy all the same features a regular PC has to offer. Surf the web, play games, watch movies, and stay in touch with friends and family – there is nothing the Morefine M1 Mini PC can’t do. Although its body is small in size, this Windows 10 mini PC packs some serious hardware. Featuring 4 cores, its Intel Atom Z8350 processor that has been clocked at 1.94GHz is capable of bringing forth a powerful performance. Additionally, the mini PC features 4GB RAM, an Intel HD Gen8 Graphics unit, and 64GB of internal memory. With all this hardware in place, you’ll be able to enjoy the latest and demanding software features without needing to worry about slowing down your device. A 64GB SD card slot furthermore allows you to increase your total memory to make sure you’ll always have enough space for all your files and media.